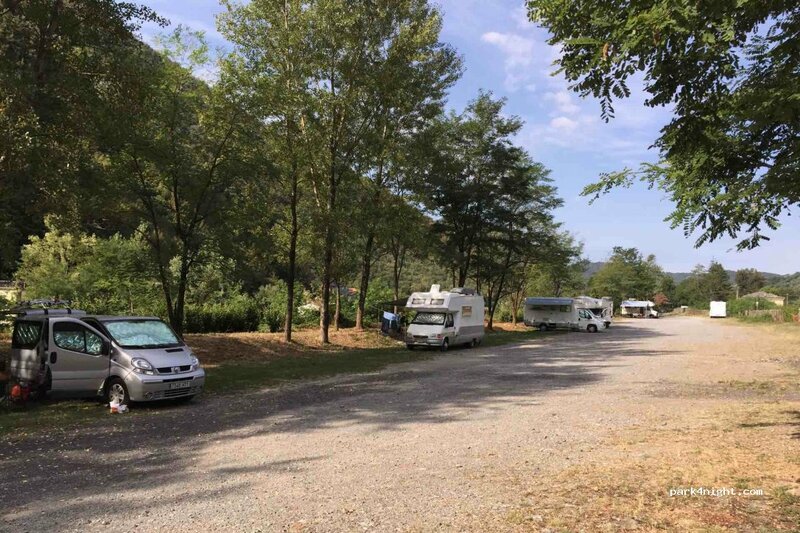 Aire de camping-cars, eau propre et vidanges gratuites. Ombre. Rivière et sources d’eau chaude à 50 mètres. Two long strips of grass around a gravel road. It’s slightly sloped, but no problem if you bring something for levelling your motor home. The parking is in the Equi Terme vicinity looking over the hotel. When you exit the parking in one direction you’re in the village. In the other direction it’s possible to access the river that has hot springs pouring into it. The springs give of a sulphur smell. WiFi can be accessed only reliably in the upper part of the parking. WiFi access instructions can be found on a sign going into the parking and by the spa. 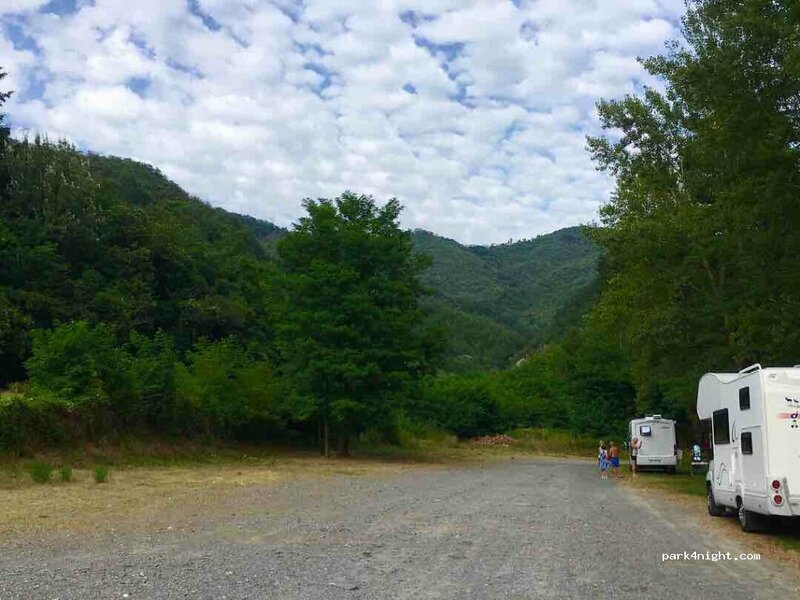 Area per camper, acqua pulita e scarico libero. Ombra. 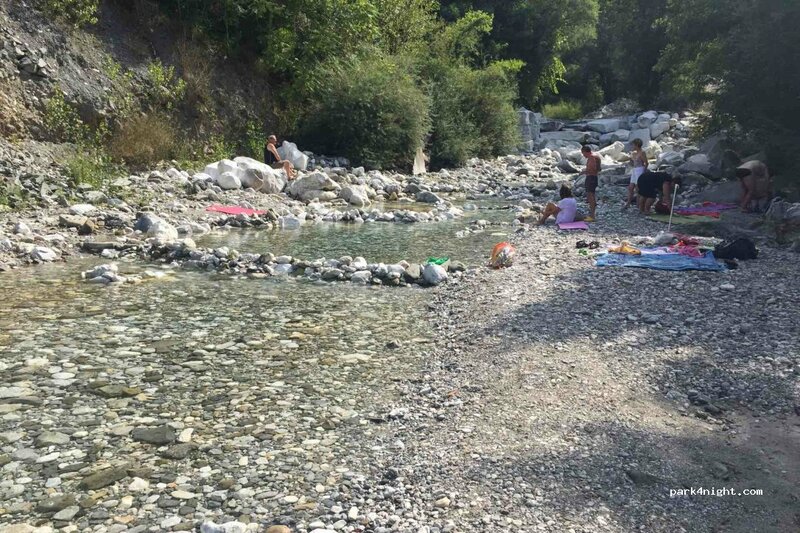 Fiume e sorgenti calde a 50 metri. Area de campers com llenado y vaciado gratis. Sombra. Rio y aguas termales a 50 metros. Nice place to stay. Free service, beautiful view. If you are sensitive the train can disturbe You because it’s near and quite loud from time to time :) a lot of campers were in the normal parking down to the road, I suppose they didn’t understand the sign that was there and was quite misleading. Beautiful setting, but extremely cold! Be aware the sun does not touch this car park at this time of the year, the mountains get in the way. Not so good for our solar. The train goes right past quite regularly through the day and evening but didn’t wake us up at night. It has water and emptying facilities but we didn’t need them. This would be a perfect place in warmer months but served us well as a stopover. The thermal springs are still warm this time of year but you’d have to be brave to get in! There is a WiFi hotspot but you need a login or an account to use it? But we have pretty good 4G so didn’t try to make one. There are recycling and bins bellow on the road near the play area. Spot sympa avec vidange et eau gratuite. Village mignon avec rivière d'eau tiède à cette période malheureusement. Unfortunately the caves were closed when we visited 13/11 but we still enjoyed the walks around the beautiful village. Free 2mb somewhat filtered WiFi which was very good for us. Excellent service point and quiet parking area very near the spring. Recommended. Quite place and free hot spa. Absolutely recommend. Super Village and nice view. Sehr ruhiger Platz verglichen mit anderen ab und zu mal ein Zug der vorbei rauscht. Die Anfahrt ist etwas abenteuerliche eine Brücke über Straße hat eine Begrenzung von 3,2 m aber ich glaube man hätte die auch umgehen können. In der Mitte ist der Bogen vermutlich trotzdem höher ich bin mit 3,2 Höhe entspannt durch gefahren. 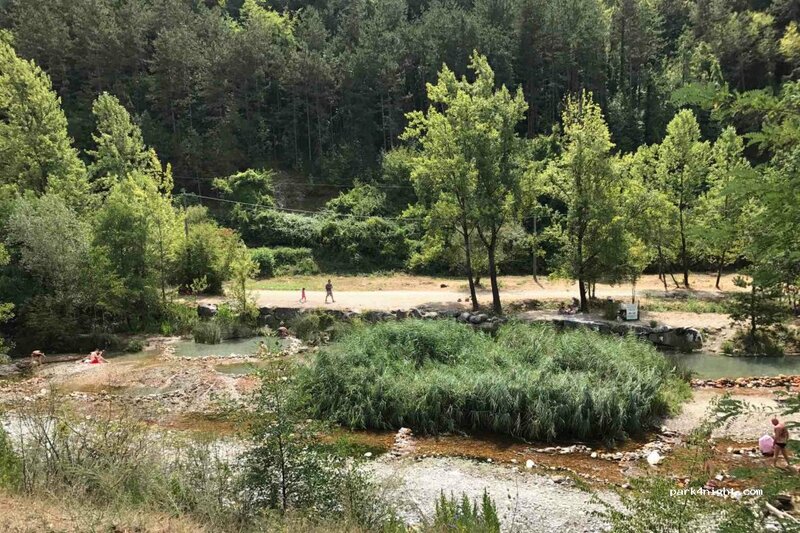 Muy agradable: área amplia, tranquila (agosto: 2 noches, 6 ACs p/noche), con sombra, al lado del río para buen baño refrescante, un paseo por el pueblo, por el entorno, visita a las cuevas,...El tren que pasa al lado, casi no molesta, sólo molestan las hormigas!. Lo peor: l@s usuari@s incívic@s q dejan fuera sus basuras. Si el cubo está lleno, llévate tu basura, POR FAVOR! Gracias Equi Terme! Date le attuali temperature, ottimo il fiume gelato appena sotto il parcheggio No Tabacchino ne alimentari!Ristorantino-bar con pago bancomat! Grotte da visitare! Ombra. Carico scarico gratis! This is such a great free spot! We stayed here a few nights as we enjoyed it so much. It’s quiet and feels very safe. There were other campers and motorhomes here every night we stayed - no more than five at a time though and the site could easily host thirty. The services are all free (no electricity though). It’s just above a river which was lovely and warm to swim in during the hot summer. One of the best free spots ever. Safe and quiet. The caves are worth the tour. Nearest shop about 4K but apparently the restaurant sill sell bread and milk and there was a visiting mobile grocer on the Thursday Access to pool (e7). Immense parking gravillonné, tout gratuit. Les sources d'eau chaudes sortent à 25 degrés. Les grottes ne se visitent que l'été, très calme la nuit, trains à partir de 7h30. Merci à la municipalité. Great quiet spot for us. beautiful valley with evening sun on the parking. plenty of safe space for our cat to explore. grey and black water emptying plus wifi! Excellente aire de camping-car gratuite, avec services gratuits. Ombragée et au cœur de la montagne. Rivière et petits bassins à côté. Mais il ne s'agit pas d'une source chaude. Large square in flat, asphalted and sunny. Not accessible on market day. 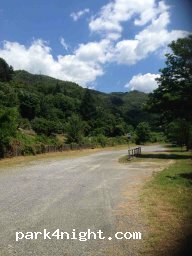 Parking of the village of Valiano.